Sometimes the market gets it wrong with dividend stocks, creating high-yield opportunities for long-term investors. The theory is that the market is efficient, taking all known information and using it to properly price stocks. Reality is a little different, since investors often make emotional decisions, rather than rational ones, that can result in stocks being mispriced over shorter periods. For long-term income investors trying to find good dividend stocks, looking for these short-term mispricings can be a great way to find high-yield opportunities. Right now it seems ExxonMobil Corporation (NYSE:XOM) and General Mills, Inc. (NYSE:GIS) are two hated dividend stocks to consider buying. Exxon has not been impressing investors lately. Oil production has been falling, and its return on capital employed (ROCE) has dropped from industry leading to simply middle of the road. The oil recovery that's taken place since early 2016 has allowed the company to put up generally improving revenue and earnings numbers, with year-over-year earnings growth each quarter for more than a year. But the underlying production and ROCE trends have left Exxon lagging behind most integrated energy peers, which have benefited more from rising oil prices. Now add the fact that Exxon is an oil company, in an industry that clean energy is expected to make obsolete. 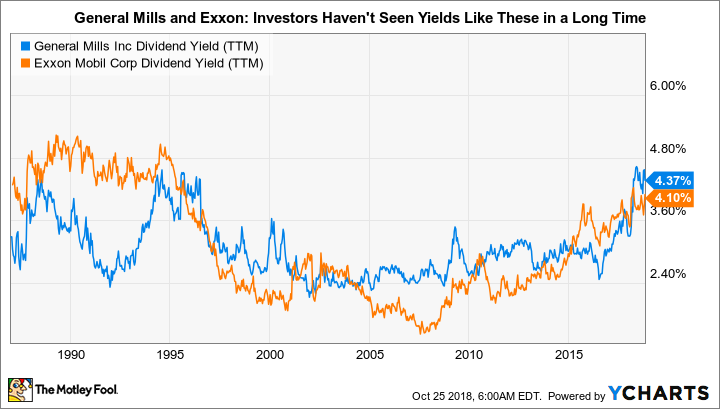 Indeed, there's good reason to dislike Exxon today, which is why the stock's yield, at a very generous 4%, is higher than it's been since the 1990s and its price to tangible book value is lower than it's been since that decade. Both suggest Exxon is on sale today. But that's only true if the oil giant can turn the ship around and get production heading higher again. It shouldn't be surprising that Exxon has a plan to do that, with the goal of doubling earnings by 2025 via new oil development and investments in its refining and chemicals businesses. To get there, oil just has to stay around $60 a barrel. Along the way the company expects to improve ROCE from the single digits to the midteens as well. As for oil and natural gas demand, Exxon doesn't see any signs of demand declining for at least another 20 years. The driving force is emerging markets, which still use materially less oil than developed ones. As these nations move up the socioeconomic ladder, oil and natural gas demand will continue to increase. And since oil and natural gas wells are depleting assets, more drilling will be needed to meet that demand. In other words, no need to drastically change the business model. If that long-term vision makes sense, and you can wait while Exxon's current round of investments put this weak patch behind it, then you can pick up a big 4% yield backed by 36 years of annual dividend increases. General Mills deals in packaged food, an area of the market that's been broadly out of favor lately. The big reason is that consumers are shifting toward food perceived to be healthier and fresher. To make matters worse, General Mills has made some notable missteps, like completely missing the Greek yogurt craze. It was so bad that the company's Yoplait brand dropped from the second-largest yogurt brand in the U.S. market to third, as Greek yogurt upstart Chobani basically ate its (yogurt) lunch. That partly explains why the stock currently yields 4.3%, the highest level in decades. The other reason is that General Mills just made a very large and expensive acquisition. Buying businesses is nothing new for the company; it's been doing that for years to help shift its business. For example, it bought Annie's and Larabar to increase its presence in the "healthy" areas that consumers are favoring today. Both deals have worked out pretty well so far, but they were on the small side. The last acquisition, however, cost a huge $8 billion and pushed the company into a new business, pet food. Investors are concerned it paid too much for the debt-funded deal, even though Blue Buffalo is an industry-leading and fast-growing brand in the healthy pet food space. That's possible, but investors shouldn't get too bogged down in the details. The debt will weigh on the company in the near term; interest expense increased 84% year over year in the fiscal first quarter. But interest earned in the quarter was nearly 4.5 times greater, providing plenty of leeway for the company to support the added cost of the deal. And Blue Buffalo continues to grow its business, with General Mills helping to expand the reach of the brand with its vast distribution network. The most likely scenario is that General Mills, which sells necessity products to lots of end customers, holds the line on the current dividend until it improves the shape of its balance sheet. Recent results, meanwhile, suggest it's starting to get the rest of its business back on track, growing share in eight of its nine core business segments. If you can deal with a little uncertainty and think long term while General Mills absorbs the Blue Buffalo acquisition, you can collect a huge yield from this iconic food company that has adjusted to shifting market trends many times in its history, which spans over a hundred years. If you buy into the idea that the stock market tends to go to extremes over the short term but rewards companies with fair valuations over the long term, then you'll want to take a look at Exxon and General Mills today. Yes, there are issues facing each company, but the out-of-favor stocks appear too cheap today when you look at their historical yield trends. Which, as it turns out, is great for long-term investors looking to add some high-yield stocks to their portfolios.